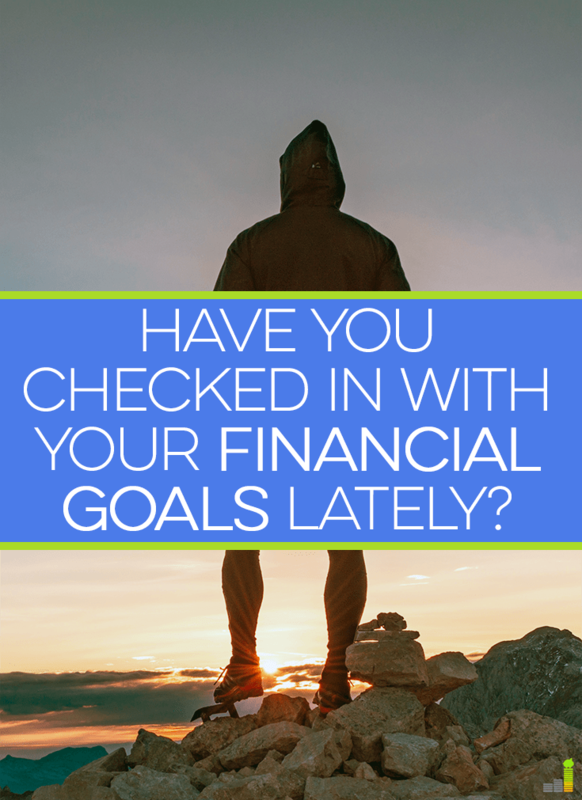 Have You Checked In With Your Financial Goals Lately? Can you believe the year is almost over? It seems like just yesterday we were all making New Year’s resolutions and talking about what we wanted to accomplish this year. We all set out with good intentions, but let’s be honest – a year is a long time! A lot of things can change. You might decide to take a different direction with your money (or your life), you might have forgotten about a few goals, or you might have struggled to stay on track because of some setbacks. Whatever the reason, it’s always worthwhile to check in with your financial goals and your finances in general throughout the year. John does quarterly goal updates and I think that’s a great way to keep yourself accountable and on the right track. Let’s take a look at how you can do this for your finances. Step One: To evaluate your goals properly, you should be tracking your progress throughout the year, even if you haven’t made much (or any) progress. If you can’t remember the goals you initially set, there’s a good chance they weren’t important enough in the first place! Get a list of your goals and start going through them one by one. Active means you’re still making progress and care about the goal; no longer pursuing means the goal isn’t a priority; changing course means you still want to achieve the goal, but you need to re-think your strategy. Step Three: Create a new list with the goals you want to focus on. Having a timeline for these goals can help you be realistic while giving you perspective. You probably can’t take on everything all at once. If you have 20 goals listed, you might want to think about paring them down to around five. Five?! Yes, maybe even less. I know the overachievers out there, like me, are probably wondering why you should limit yourself. I’ve found the less you have on your list, the more you can focus. If you’re serious about accomplishing your goals, you need the resources to do it. Those resources include your time and mental bandwidth. You can’t stretch yourself too thin. I recommend targeting the goals you’re super excited about that also pack the biggest punches. Things tend to fall into place when you have more motivation. For example, maybe “budgeting” in general doesn’t excite you, but saving up for a vacation does. You might be more inclined to keep your spending in check because you want to save as much as possible. Overall, the point of evaluating your goals is to regroup. It’s foolish to state you want to achieve ten specific things from January to December and never check in with how you’re doing. Most worthwhile journeys aren’t linear – it stands to reason your goals aren’t, either. If you have a family or a partner, it’s even more important to check in together to make sure everyone is on the same page. You and your spouse may have been really excited to pay off debt at the beginning of the year, but halfway through, found out you were pregnant. You might have decided to hold off on debt repayment to save for the baby. There’s nothing wrong with that, but it helps to clarify your goals together so there’s no miscommunication about the direction you’re heading in. Speaking of the direction you’re going in, you need to think about how you plan on reaching your new goals. This can only happen once you have the clarity evaluating your goals will give you. If you’re giving any of your previous goals another go, make sure you note what went wrong the first time. Many people want to budget or track their spending, but give up because it’s too tedious or complex. Give yourself a little flexibility and try different methods; don’t quit if you don’t succeed right away! If you’re setting new goals, the SMART method is a good template to use for your plan. Of course, even after you create this new plan, you should still continue checking in on your progress regularly. You don’t want anything to fall by the wayside again. Grab an accountability partner, update friends and family on the status of your goals, or blog/journal about it! Paying off any debt – student loans, medical, credit card, etc. Try to identify any issues you’ve noticed where money management is concerned, and get to work on those! I bring this up now because many people have completed their third quarter goal updates and might be rallying for the end of the year. While it’s great to give one last big push to reach a goal or milestone, you should be doing it for the right reasons. I have a bad habit of sticking to things out of pure stubbornness. If you’re like me, you might feel down about your lack of progress in some areas and be determined to make up for it. I think the smarter idea is to ask yourself why there has been a lack of progress. That’s why re-evaluating is necessary. There’s no point in expending your efforts on something that no longer matters to you. Likewise, if the lack of progress is due to a certain method not working for you, don’t keep running into the same wall over and over again. You might be bummed out by the thought of starting over now when there’s only a few months left, but it doesn’t matter when you start over (or begin in the first place). If you want to go for something right now, then do it! You don’t have to wait for an arbitrary day like the first of the month of the year. 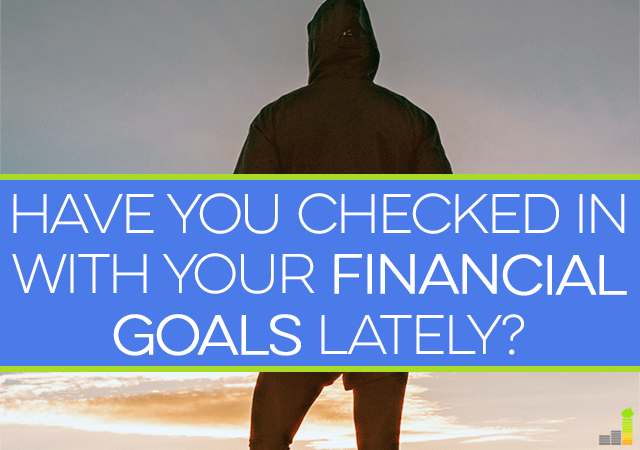 When’s the last time you checked in with your financial goals? Do you perform quarterly updates? How do you keep yourself accountable and on track? Do you evaluate your goals each time you do an update? We have a big spreadsheet that we check about every month. We have a mortgage-payoff table in there that has helped so much to visualize the progress and feel like we’re actually getting somewhere. It’s made a big difference, and if we stay on track we’ll be 100% debt free in less than a year. That’s awesome, I love it! Visualization is such a big thing. It’s so nice to see how far you’ve come and what progress you’ve made. Good luck – I’m sure you can’t wait! Yes I check mine monthly and if I am lacking on one of them, I give it more focus than the others. I try to accomplish all of them, but if I miss one I don’t let it get the best of me. Hopefully by December I will complete a very important dividend goal. Good luck on your goal! That’s great you do monthly check ins and don’t let your lack of progress get to you. One of the most important things is getting in that mentality, which is something I need to work on. It’s interesting. Sometimes I don’t take my own advice, because I definitely think it’s a good idea to list out your financial goals in detail, but I don’t always do it. Right now I have some high-level financial goals, such as increasing my income year-over-year, slowly paying down student loans & mortgage, continuing to invest, NOT cashing out my ESPP….It’s all sort of “directional” goals and so far it’s worked well for me. I used to have more specific goals like “make $1k/month in side income to offset debt” but now I’ve moved more to “directional” goals, for better or for worse. I tend to be the same way. I don’t set strict goals for myself as it’s rarely worked well for me in the past. As long as I’m paying extra on my student loans, earning more (which I do track) and keeping my savings in check, I’m happy. That’s what I’m focused on the most right now. Once my student loans are paid off, I’ll move on to other things. I think you have to be disciplined to take this approach, though, which is why I recommend that others track their progress diligently. I will say there’s always room for improvement, but you can only take on so much at once before you start stalling out! Thanks for reminding me Erin. I actually to check my financial goals every four months. But, I think I need to do this more often like every month so that I am updated and can track my status with regard to financial goals because I think doing it more often is beneficial. Checking in quarterly is great! If you find you need to monitor your progress more, definitely do what works for you. Sometimes breaking up the bigger goals into smaller monthly goals helps. I am a big fan of the quarterly goal check in, not just for me but for my clients. It’s funny because when we start working together, many of my clients assume quarterly is too frequently; however, once we start, they realize the value of checking in, observing progress of lack thereof and making changes. The sooner you check in, the easier it is to make adjustments. Plus they’re always surprised at how much life can change in a matter of months. When you’re first thinking about it, quarterly does sound a lot, but times flies by SO fast. It’s very easy to lose track of your goals when so many other things are happening. Like you said, so many things can happen in the span of a few months! I’m afraid I haven’t written down a formal set of financial goals yet, but I do have them wandering around in my head most of the time. Ideally, a spreadsheet of all our accounts and assets would be the solution, tied to another spreadsheet about monthly expenses. I do have an informal method to it all though, where I commit to spending a limited amount of cash during any given month so everything else goes straight into savings, but I admit that method can use a lot of improvement. That doesn’t sound like a bad method, Fehmeen. It can be easier to give yourself that cash budget to stick to and have everything else on autopilot. At least you know you’re still saving money! I check my financial goals quarterly and I find it really fine because I can see my status and where I am lacking in some areas in terms of financial goals, Erin. Glad you’ve found a way that works for you!